Set a wok or large frying pan on high heat and add in seeds and cashews while pan is heating. Place another large sauce pan over high heat. Add the chicken broth to the sauce pan and cover. Toss the seeds and nuts until they are heated through, this will take a few minutes. While they are heating, slice the chicken breasts into 3 pieces. Coat the chicken with the 5 spice powder, salt, and pepper. When the seeds and nuts are done, transfer them to a plate on the side. Put the empty pan back over high heat and add a little olive oil. Put the chicken in the pan and cook for 5 minutes, until golden, turning occasionally. Peel and finely slice ginger and chili while the chicken is cooking. Take the lid off the sauce pan that contains the chicken broth and add half the chili, all of the ginger, snow peas, asparagus, your rice sticks (or vermicelli), corn, and 2 tablespoons of soy sauce. Bring this to a boil and cook for 2 to 3 minutes, stirring. Halve the lime and squeeze in the juice. The chicken will be cooked by the time the rice sticks and veggies are done. Take a piece of chicken out and slice it lengthways to check if it is cooked all of the way. If not cook for an additional 2-3 minutes. When done, remove the chicken from the pan and slice each piece in half. To serve Asian chicken noodle soup, divide the spinach leaves between your bowls and pour over the broth, rice sticks, and vegetables. 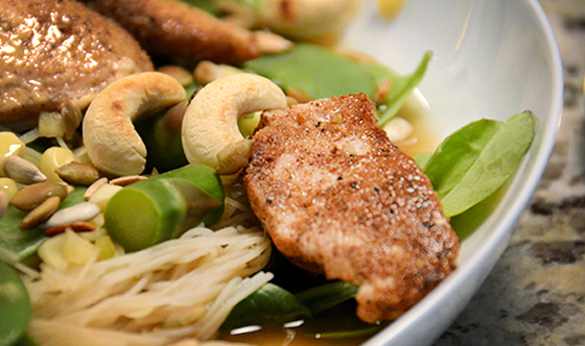 Divide the chicken pieces over and scatter with the toasted seeds, cashews, and remaining chili.